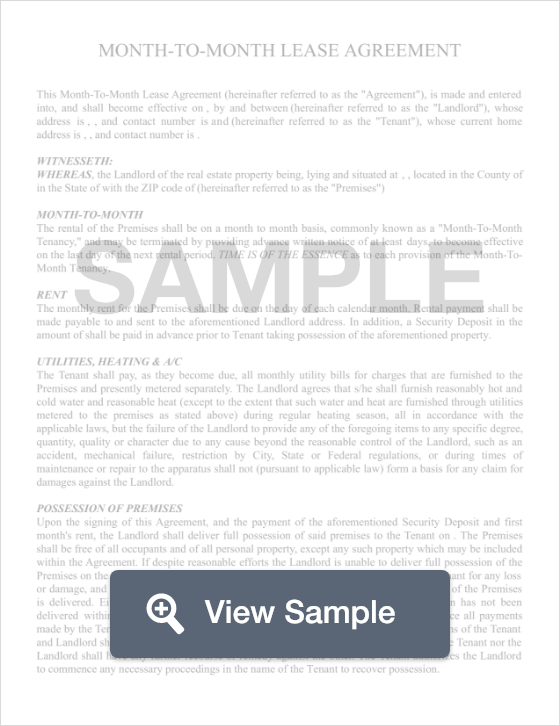 What is a Kentucky Month to Month Lease Agreement? Kentucky Month to Month Lease Agreement: What Is It? In Kentucky, a month to month lease agreement is a legal contract that locks in the specifications and terms to the lease of an apartment or rental property. This type of agreement is legally binding and spells out the important details about the agreement such as rent payments, rent amount, and rules of tenancy and the length of the lease. In this case, the lease is valid for the period of one month. Without the action of either party, a month to month lease will continue to renew automatically until one party decides to terminate the agreement. When one of the parties is ready to terminate the agreement, they must submit a written letter stating their intent to terminate, at least 30 days before ending the agreement. According to Kentucky Law, a tenant is required to provide his or her landlord or property manager at least 30-days notice before terminating the agreement.